Today was Caleb’s first day in kindergarten. He is the third kid we’re sending to the same kindergarten so we’ve got the entire process down. We were in and out in less than ten minutes! Caleb didn’t have much trouble adjusting because Daryl was in the six year old class. He didn’t have any separation anxiety because we told him Daryl was in the next room. This is one advantage having the two boys so close together. The older brother will always be there for the younger one. I think the biggest shock to Caleb is when the teachers spoke to him in Mandarin. I don’t think he imagined that. But the teachers will mix English and Mandarin in the first few months. When we arrived, all the teachers remembered Rachel and they were spending time chatting with her. Daryl pretty much went to his class by himself, looking for his best friends. He had so much to talk to them about. Teacher invited Caleb to sit down next to a boy, and he became very quiet. He’s exactly like me. He becomes quiet when strangers are around. We thought he looked a bit nervous. We left after a few minutes. There were a lot of parents around. Some of the new kids were crying and I knew exactly what they were feeling because we went through that stage. After a few hours, we picked the boys up from kindergarten and Caleb said he had fun. That’s great news for us. I hope he maintains that positive outlook for the rest of the year. I’m happy that he enjoys himself so far. Part of me feels sad. 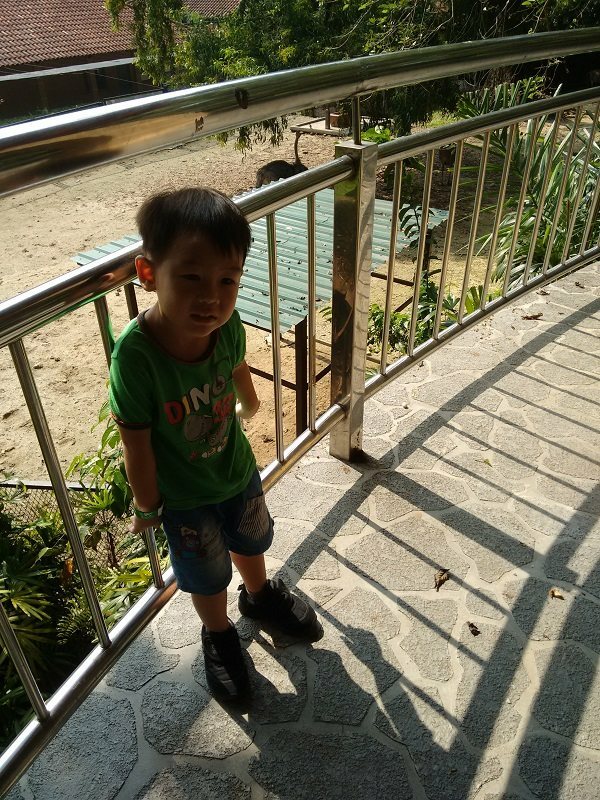 My baby Caleb is taking his first steps away from home. 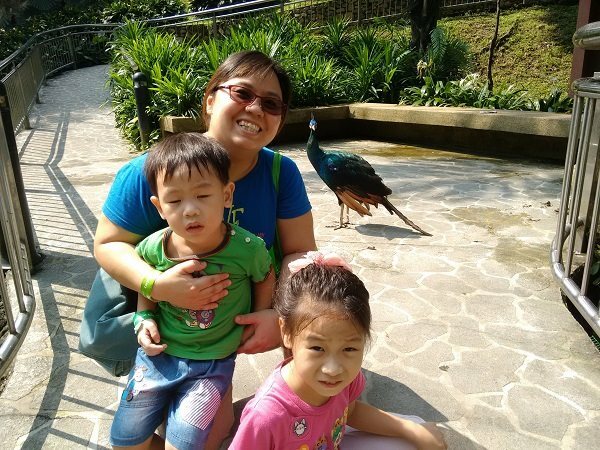 Early last month I took annual leave to bring the kids to the KL Bird Park. It was the school holidays so we wanted to bring them somewhere special. We made our way to KL after the morning rush hour, and purchased our tickets at the counter. The ticket price for adults with MyKad are RM27. If you have AEON card, you can get a ticket for only RM20. Kids (aged 3-11) with MyKid can get tickets for RM13. The photo above was taken at the souvenir photo stand. It was quite expensive but I thought it would be something memorable. The kids were terrified. 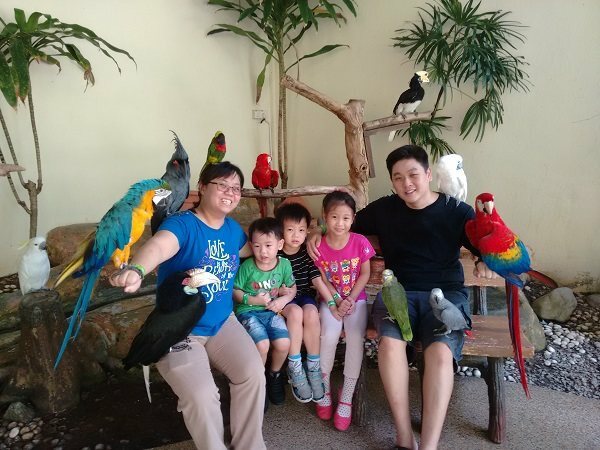 The birds were heavier than I expected. 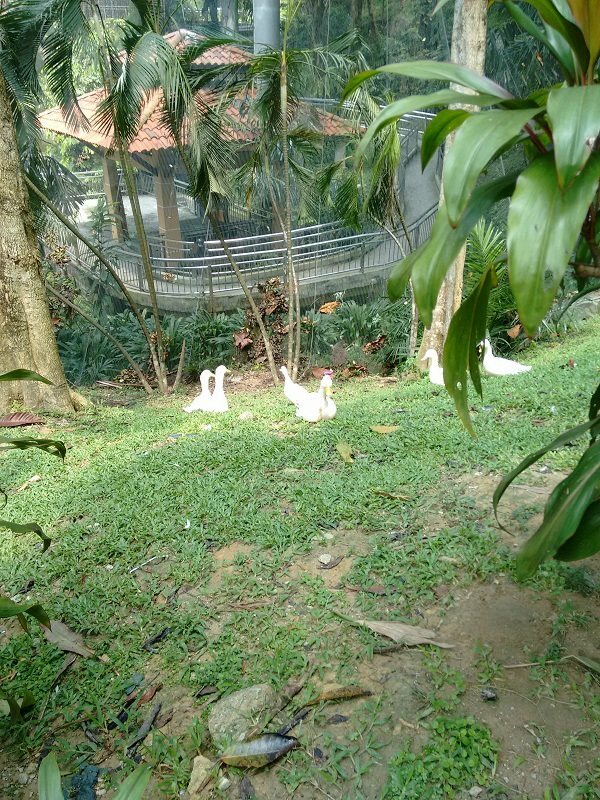 The Bird Park is quite a big place. I was just recovering from throat infection and fever. Thankfully I managed to make it through by walking slowly and taking many breaks. 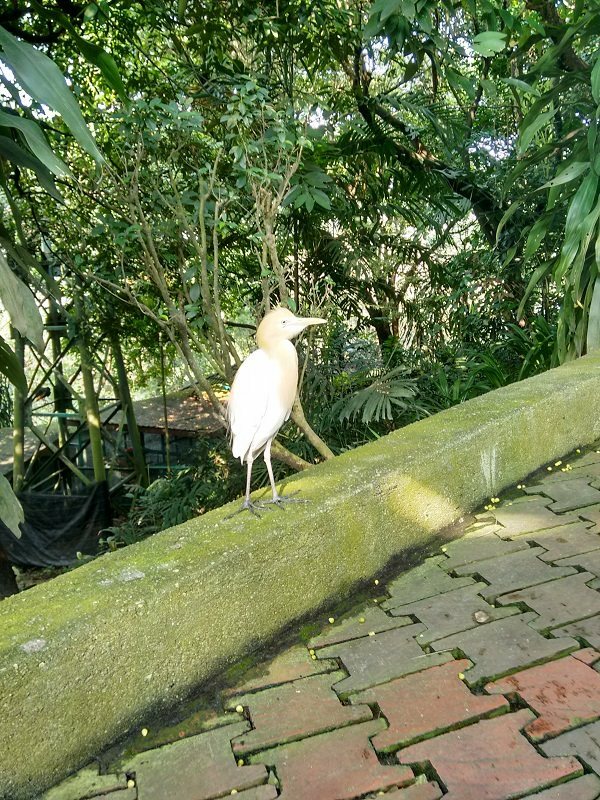 When we first went in the aviary, this bird was following us. Later we realized that visitors could buy some bird feed to feed the birds. No wonder they were trained to follow humans around! Honestly I can’t identify the bird species. 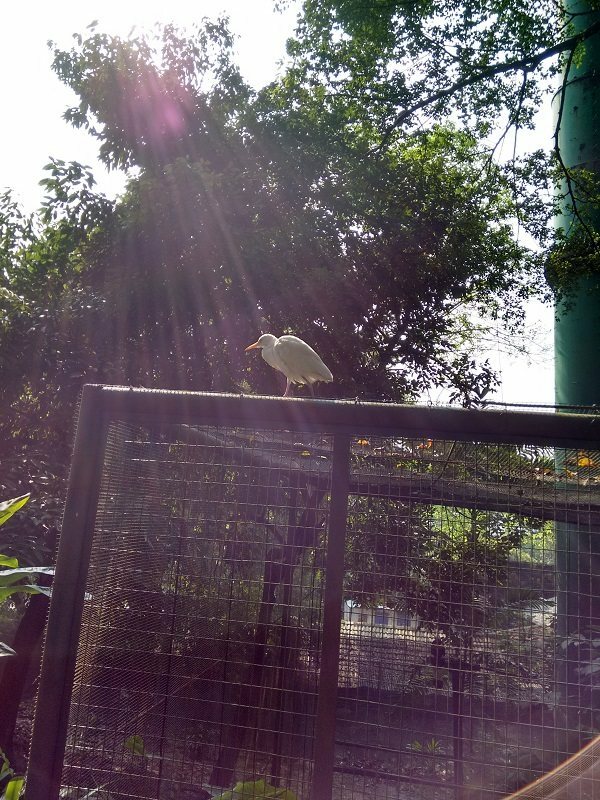 Here’s one climbing on top of a bird cage. The sun was shining but I remember it rained the night before. So the weather wasn’t too hot. 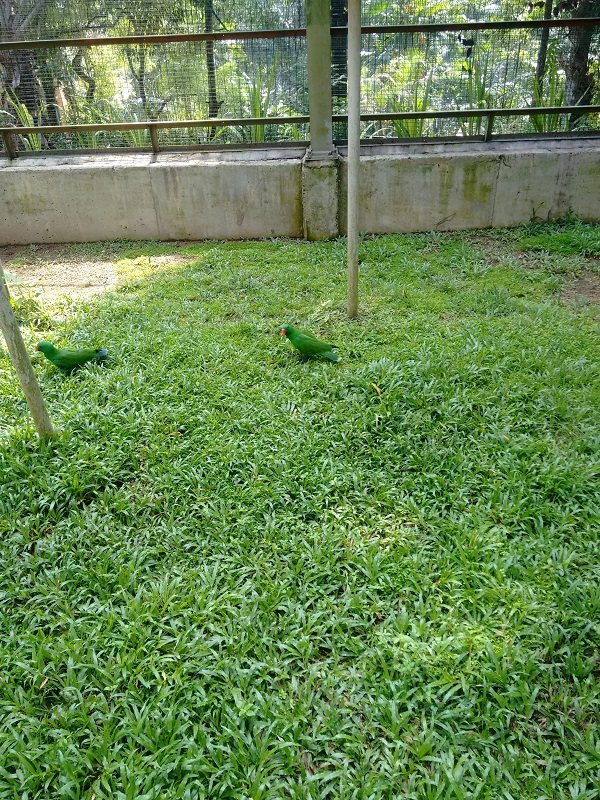 Some green birds on the green grass. Sorry I’m not being very helpful with the bird names here haha. 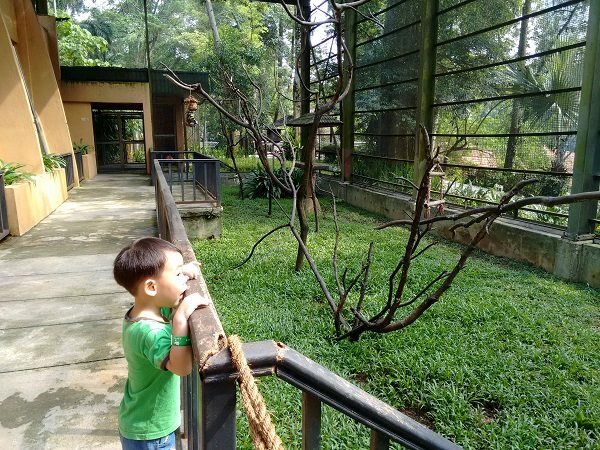 Caleb was really fascinated with the birds. Caleb posing for a photo with an ostrich in the background. The kids had the chance to feed some vegetables to the ostrich. 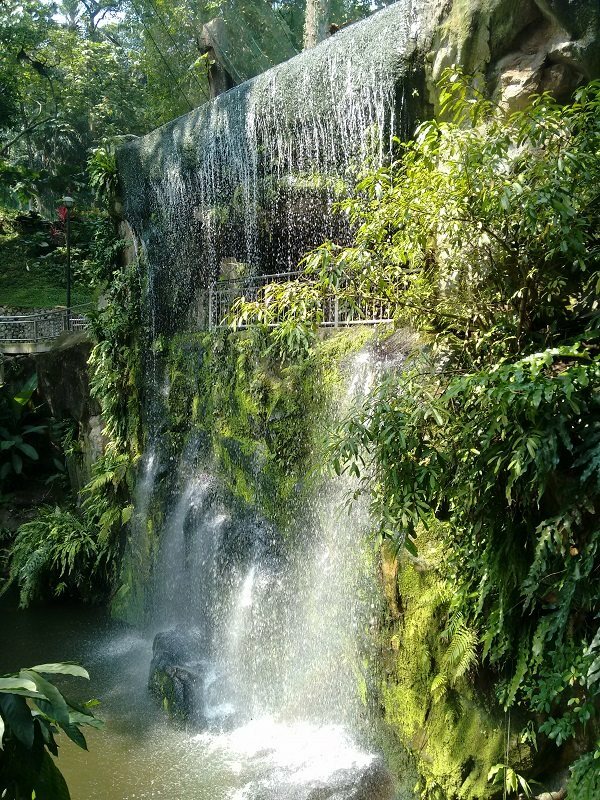 The waterfall I mentioned in my previous blog post. It made me feel calm and relaxed. 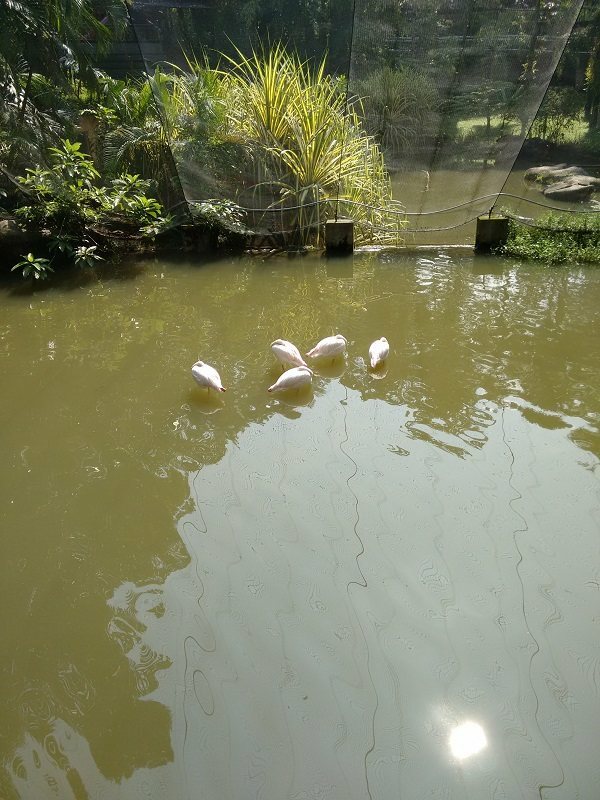 I think these are flamingoes. 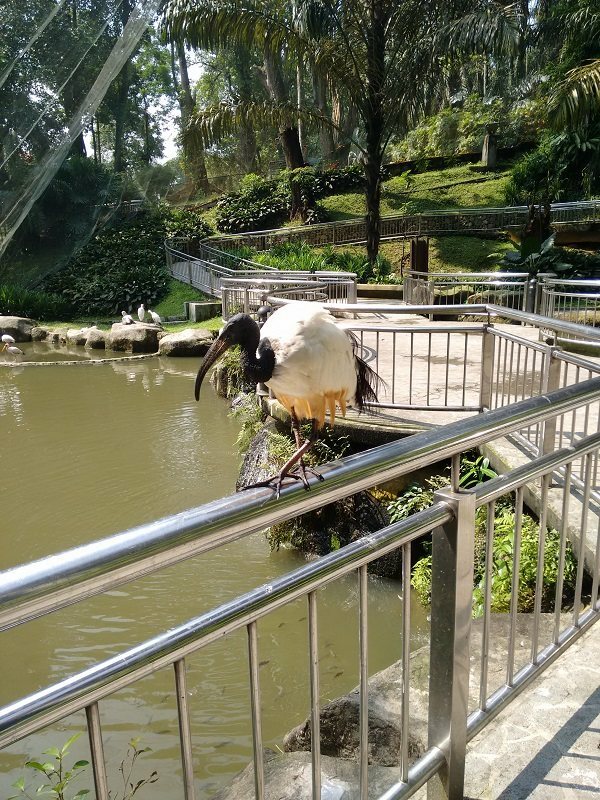 A bird walking on the metal railing with a dinosaur pose. More flamingos. Looked like they were asleep. 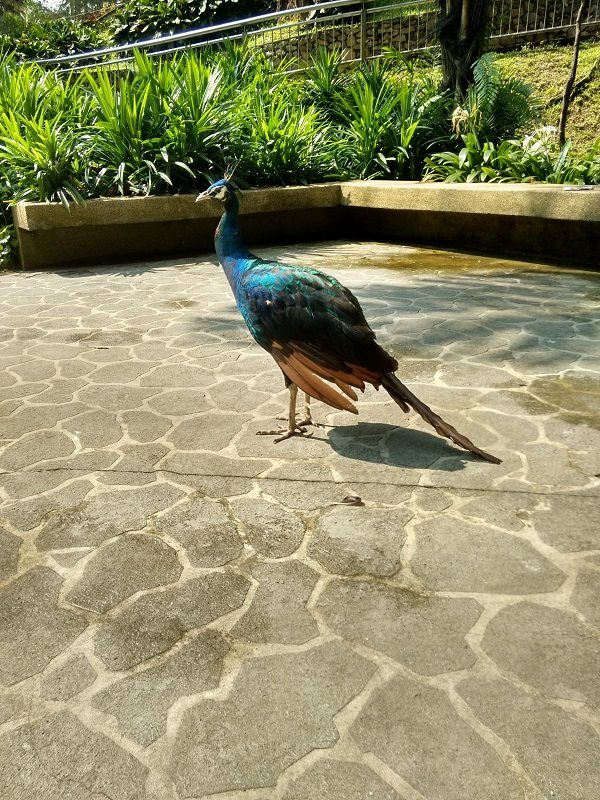 A peacock. We saw six or seven of them. We tried to take a photo near the peacock but the kids were to afraid to pose properly. 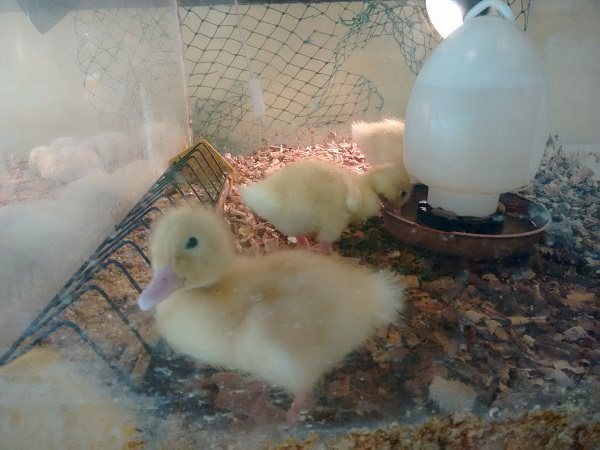 An indoor exhibit with egg incubators, chicks and ducklings. 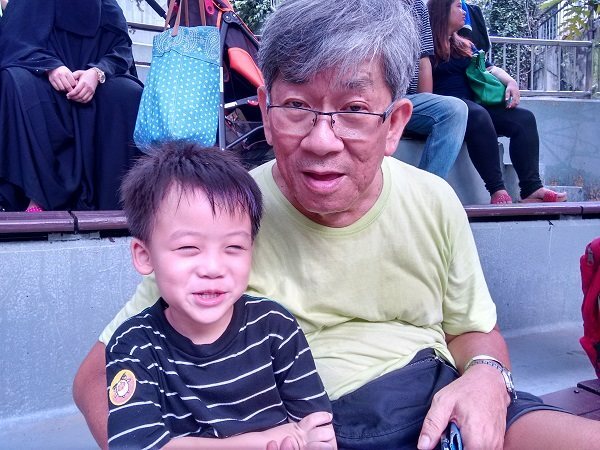 Daryl making faces with grandpa while we were waiting for the Bird Show. We left went home after the 12:30 show. We spent about 3.5 hours there. 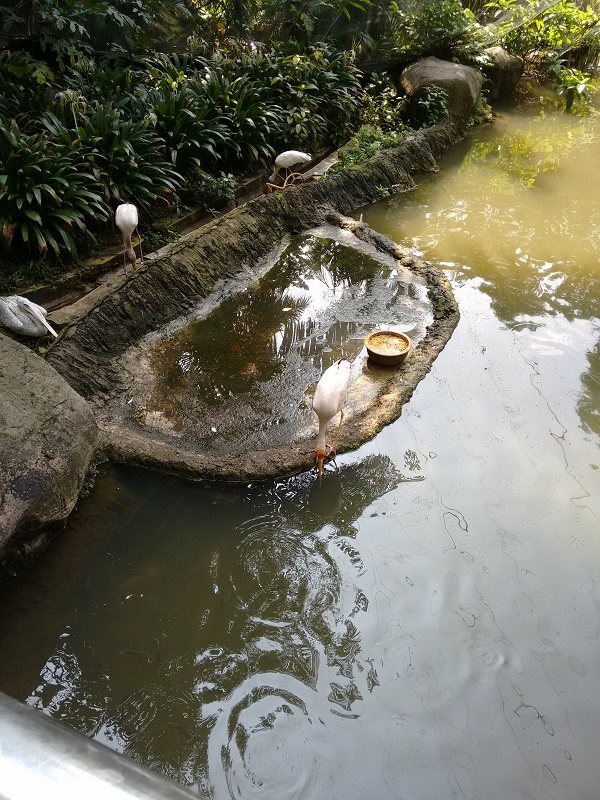 What I liked about the KL Bird Park is how close you can get to the birds. The admission ticket is reasonably priced. There are a lot of birds to see. The bird show is entertaining enough to capture the kids attention. The kids enjoyed themselves and we adults enjoyed spending the time with them.